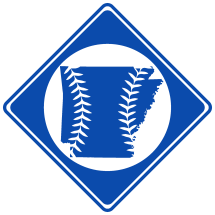 The Hot Springs Blues were a professional baseball team based in Hot Springs, AR in the 1887 Southwestern League. Charles Bradley2 "of New Orleans"
Frank Hoffman Houston, TX "Secured from the Southern League," "Of New Orleans"
Lang "late of the defunct Mobiles"
3. There were two Conways in the league, one appearing for both Pine Bluff and Hot Springs in a box score in The Sporting News, 6/25/1887, p.5. One of the two was Steve Conway, but it is unclear which.